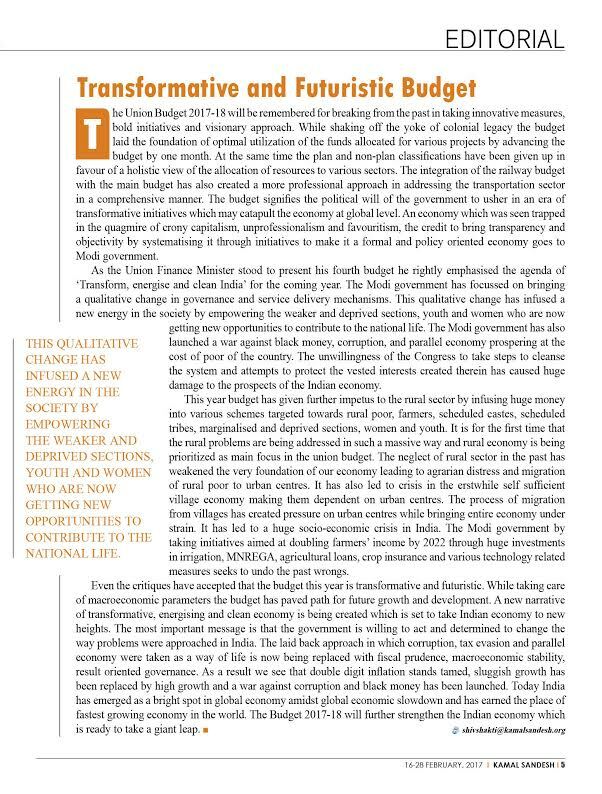 The Union Budget 2017-18 will be remembered for breaking from the past in taking innovative measures, bold initiatives and visionary approach. While shaking off the yoke of colonial legacy the budget laid the foundation of optimal utilization of the funds allocated for various projects by advancing the budget by one month. At the same time the plan and non-plan classifications have been given up in favour of a holistic view of the allocation of resources to various sectors. The integration of the railway budget with the main budget has also created a more professional approach in addressing the transportation sector in a comprehensive manner. The budget signifies the political will of the government to usher in an era of transformative initiatives which may catapult the economy at global level. An economy which was seen trapped in the quagmire of crony capitalism, unprofessionalism and favouritism, the credit to bring transparency and objectivity by systematising it through initiatives to make it a formal and policy oriented economy goes to Modi government. As the Union Finance Minister stood to present his fourth budget he rightly emphasised the agenda of ‘Transform, energise and clean India’ for the coming year. The Modi government has focussed on bringing a qualitative change in governance and service delivery mechanisms. This qualitative change has infused a new energy in the society by empowering the weaker and deprived sections, youth and women who are now getting new opportunities to contribute to the national life. The Modi government has also launched a war against black money, corruption, and parallel economy prospering at the cost of poor of the country. The unwillingness of the Congress to take steps to cleanse the system and attempts to protect the vested interests created therein has caused huge damage to the prospects of the Indian economy. This year budget has given further impetus to the rural sector by infusing huge money into various schemes targeted towards rural poor, farmers, scheduled castes, scheduled tribes, marginalised and deprived sections, women and youth. It is for the first time that the rural problems are being addressed in such a massive way and rural economy is being prioritized as main focus in the union budget. The neglect of rural sector in the past has weakened the very foundation of our economy leading to agrarian distress and migration of rural poor to urban centres. It has also led to crisis in the erstwhile self sufficient village economy making them dependent on urban centres. The process of migration from villages has created pressure on urban centres while bringing entire economy under strain. It has led to a huge socio-economic crisis in India. The Modi government by taking initiatives aimed at doubling farmers’ income by 2022 through huge investments in irrigation, MNREGA, agricultural loans, crop insurance and various technology related measures seeks to undo the past wrongs.